Everything is perfect when you get a shiny new induction cooktop. The surface is unmarked, the induction burners heat up your food so quickly it’s like magic and you’re proud of your new purchase. Then, out of the blue, the unexpected happens. A pot boils over. Disaster strikes, panic sets in and you know your beautiful new cooktop is ruined. Not so. Find out how to keep your cooktop cleaner. The great thing about induction cooking is that there is only a small amount of residual heat on the cooktop. This means spills don’t stick and burn onto the surface like they do with other electric cooktops. If you have a boil over there will still be a mess to clean up but it is so much more simple with induction than with any other type of cooking appliance. However, there is more to know that just using a cooktop cleaner. First things first, if you allow the induction cooktop surface to become physically damaged it will never recover. Small and very light scratches are inevitable and don’t affect the cooking surface. However, if you do start to see some light scratches they can become smoother and less noticeable by using special ceramic cleaner daily (see details under the Cleaning section below). Things to avoid are sand or grit type substances getting onto the cooktop or under the pans you use. The best option is to buy a new set of pans when you get a new induction cooktop. You should also remove salt or seasonings as soon as they get onto the ceramic surface. Can I keep my old pans? If you want to keep your old pans it’s a good idea to clean them thoroughly and ensure any grit or grease is completely removed from the bottom before you start using them. Once you’re cooking with induction your pans will stay clean on the bottom so you’ll only have to do this big cleaning job once at the beginning. Some induction cooktop instruction manuals also warn that diamond rings can scratch your cooktop surface. So be careful of that engagement ring when you’re whipping up a storm in the kitchen. That romantic dinner for two could end in tears if you damage your shiny new induction cooktop. This next one is obvious, but some cooks still need to hear it. Don’t cut anything on the top of your cooktop. If you are a devotee of the kitchen cutting board like me then you’ll never even contemplate cutting vegetables anywhere else. However, I know plenty of people who slice through a tomato on their counter top and I’m guessing if you do it on the counter you’re also likely to be tempted to do it on the cooktop. Don’t be tempted. Many knives are capable of cutting into the surface and you’ll pay for it with a permanent scratch across your shiny surface. Never use your induction cooktop as a workbench but if you do need to store something on top of the cooktop while it is not in use make sure you cover it with a protective layer. A silicone baking sheet can be useful as protection. Similarly a lightweight cutting board can stop items scratching the surface. Never let your children run a toy over the induction cooktop surface. You may become complacent because induction cooking is so much safer with children around. Children are less likely to accidentally turn the cooktop on and less likely to accidentally touch a warm hotplate (if you’re interested to know more about the safety features on certain models click here). They are less likely to burn themselves. However, young children still shouldn’t be allowed to touch the surface because there can still be residual heat at a high temperature straight after cooking. As well as the risk of burns there is a high chance of children scratching the surface if they run a toy car over it or whack it with a hard object. Aluminum foil and plastic can melt onto your induction cooktop when hot. Never use products containing these substances on the surface of your cooktop. Cooktop cleaner will not remove melted aluminium foil or plastic. Cleaning an induction cooktop is easy. There are no baked on spills to deal with. There are no hard to get at places because you only have one smooth shiny surface to clean. Induction cooking is a pleasure. How do I remove a boil over? A quick wipe over is usually all it takes to keep everything shiny and new. Obviously if you have a boil over you’ll need to remove the spill. If there is some food on the heated surface you can purchase a special scraper for burnt on food. If it is only a small patch I have been known to use my finger nail to scrape the surface once cool (this is not recommended by the manufacturers!!). Apart from removing any actual spills there is also daily cooktop cleaner as well as heavy duty cooktop cleaner available to purchase for your induction cooktop. Personally, I’ve never needed to use the daily cooktop cleaner each and every day. If I have friends coming over I will use the daily cleaner about twice a week just to make sure my cooktop looks specially clean and shiny for my visitors. If you have the time you could use it daily, but I’ve never met a person yet who actually does this. Induction cooktop cleaner is amazing stuff. It saves you from having to do much at all. You won’t go through it as fast as you think, but make sure you always have it on hand because nothing else gives you such an amazing shiny appearance on your cooktop. As for the heavy duty cooktop cleaner, it’s great to have it on hand in my kitchen but it’s not something I use every week. It’s really only for use after a spill when I can still see a residual mark on the cooktop. I would still recommend having it ready in your kitchen because when you need it you don’t want to have to get to the shops and hunt it down or wait for an online delivery. Can I clean while the surface is hot? Don’t be tempted to clean your induction cooktop surface while it’s hot. Even though you want to remove a spill as fast as possible it’s extremely important not to use the ceramic cooktop cleaner on a hot surface. It can produce dangerous fumes which can jeopardize the health of you and your family. Using cooktop cleaner while the glass is hot can also damage the surface as a result of a chemical reaction which can attack the integrity of the ceramic surface. It is important to only use cleaning products that are specially designed for ceramic/glass tops. These shouldn’t leave a smear. Never use regular kitchen cleaner because many contain abrasive ingredients that could strip away the shine from the surface on your induction cooktop. 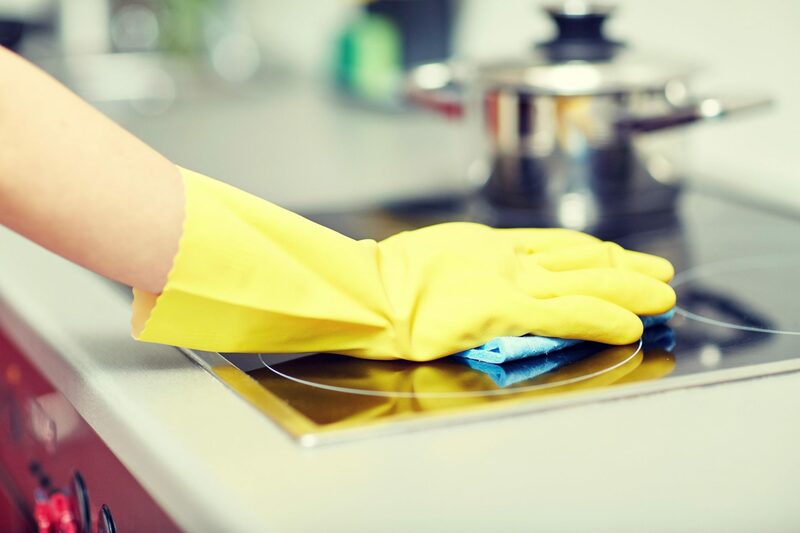 Normal kitchen cleaners can also leave a cloudy appearance on the surface of your cooktop. This is why it is important to use special ceramic cooktop cleaner. Never be tempted to use glass cleaners containing chlorine bleach or ammonia. These products will seriously compromise the appearance of your induction cooktop. Likewise, avoid powdery cleaners, caustic cleaners and abrasive sponges or scouring pads. Most manufacturers recommend only cleaning the surface once it is completely cool. However, there seems to be a general exception to this for spilt sugar, sugar syrup, tomato products and milk. These ingredients should be removed straight away with a razor blade scraper. Of course, check the instruction manual for your induction cooktop for specific manufacturer’s recommendations because this can vary between different models. Never clean the control markings with a cleaning product unless is says it is safe to do so. You may reduce the visibility of the display or ruin the function of the controls. A simple wipe over with a soft cloth is usually suitable for the controls because they are slightly removed from the induction hotplates and therefore don’t receive residual heat. If you’re using a heavy pot or pan on your induction cooktop consider placing a thin silicone baking sheet between the pot and the cooktop surface. Heavy pots are more difficult to lift and there is a greater chance of the pot being moved slightly across the surface because of this. If a heavy pot is scraped across the induction cooktop surface it will most likely scratch. A silicone baking sheet is great at protecting from heavy pots. How do I stop splatter? Spills and splatters can be caught using a piece of kitchen paper between the pot and the cooktop surface. This is a simple solution and it is only available on induction cooktops because it does not heat up as a result of the induction hotplate. The paper only receives residual heat. This is also a great party trick if your friends don’t have an induction cooktop. They will be amazed it doesn’t catch on fire while you have a pot of water boiling on top! When it comes to protecting your cooktop there are some simple precautions. Don’t place heavy objects on a shelf above the cooktop. Everyone knows what the risk is but people still do this and ending up paying the price. One woman dropped a heavy Le Creuset pot from a shelf onto her new induction range and managed to crack the entire ceramic surface. It wouldn’t matter whether it was an induction cooktop or any other type of ceramic cooktop, it will never withstand a Le Creuset dropped from a height. The simple answer is to never store such heavy items in such a precarious position. If you want your kitchen to look good and your cooktop to stay shiny and new, induction cooking is perfect. With only residual heat on the surface, induction cooktops are the easiest to clean. With very little effort you can keep your cooktop looking like new. A ceramic cooktop cleaner is important and with a few other precautions that’s all you need to look after your induction cooktop for many years to come.